American History 14 Edition Connect students to the experience of history. Connect students to success in history.American History shows students that history is not just a collection of names and dates, but an ongoing story, which teaches us about the present as well as the past. Known for its clear narrative voice and impeccable scholarship, Alan Brinkley's best-selling survey text invites students to think critically about the many forces that continually create the United States. 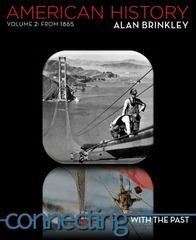 In a concise but wide-ranging narrative, Brinkley shows the diversity and complexity of the nation and of our understanding of its history—an understanding that continues to evolve both in the events of the present and in our reexamination of new evidence and perspectives on the past. This 14th edition features a new series of Consider the Source essays, a brand new pedagogy program, four new America in the World essays, and extensive content updates that demonstrate how a new generation of historians and of historical actors continues to shape the American story.